Resurfacing works on Greetwell Road B1308 will begin from 7pm tonight. The road, on which Lincoln County Hospital and Lincoln Prison are based, will be split for two sections of works this month. The first 120m of Greetwell Road to the east of the junction with Wragby Road will be resurfaced between 7pm and 12am from November 7 to November 11. Diversion routes from Lincolnshire County Council. 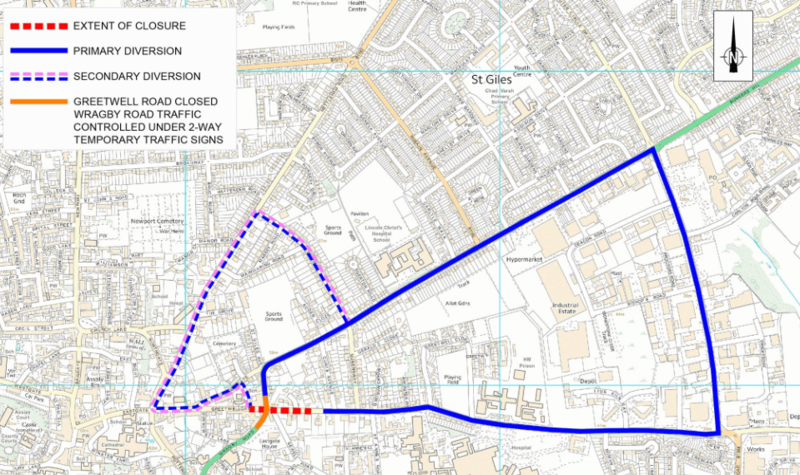 In addition, the first 15m section of Greetwell Gate to the west will be closed to traffic. A diversion will be signposted via the A15 Wragby Road and B1308 Outer Circle Road and temporary traffic signals will be in place to control northbound and southbound traffic on Wragby Road. Minor local diversions will be in place for residents of Greetwell Gate and Tower Gardens. From November 21 to 28, the eastern end of Greetwell Road (near the mini roundabout joining Outer Circle Road) will be resurfaced overnight from 7pm to 12am. A diversion route will be via the A15 Wragby Road and B1308 Outer Circle Road. Paul Little, network manager at Lincolnshire County Council, said: “This investment in works on Greetwell Road will ensure this busy road in Lincoln will remain in good condition for several years. “he works will take place overnight to keep disruption to drivers and resident to a minimum.